Andrew Flower 06/12. N.Z. Peter Tristram 06/12. 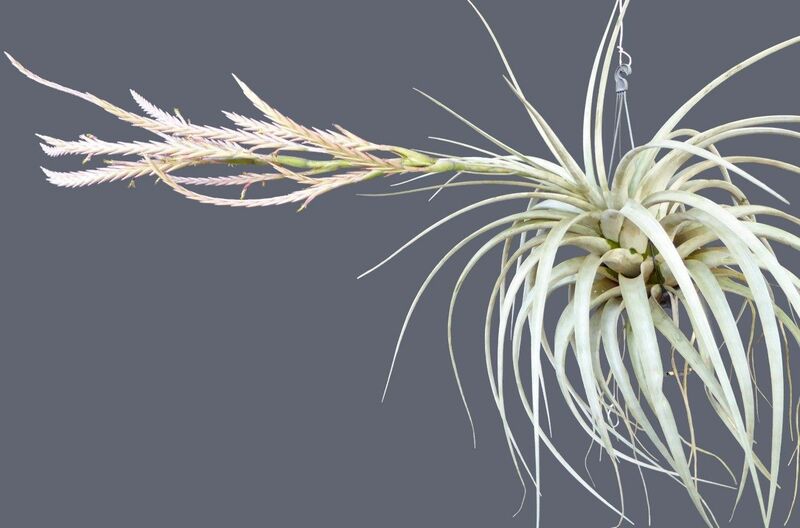 A plant from Paul Isley that Harry and I both keyed to hitchcockiana (no stolons). Peter Tristram 06/12. Recent import from KK. Keys close to hitchcockiana (no stolons). Chris Larson 08/12 from Knize. Andrew Flower..."Seed from K Knize, as "Vriesea hirschopfiana KK42", sown 21/03/1993, currently flowering for the first time." Barry Genn..."It's a long slog growing seed. Nearly Twenty years before the reward of flowering them." 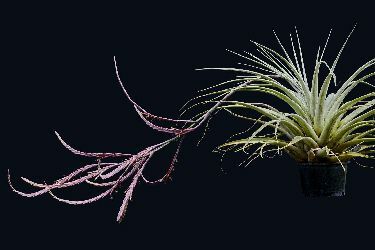 Bruce Dunstan...."As mentioned, what I thought may have been TV hitchcockiana has flowered and looks to be very close to yours. 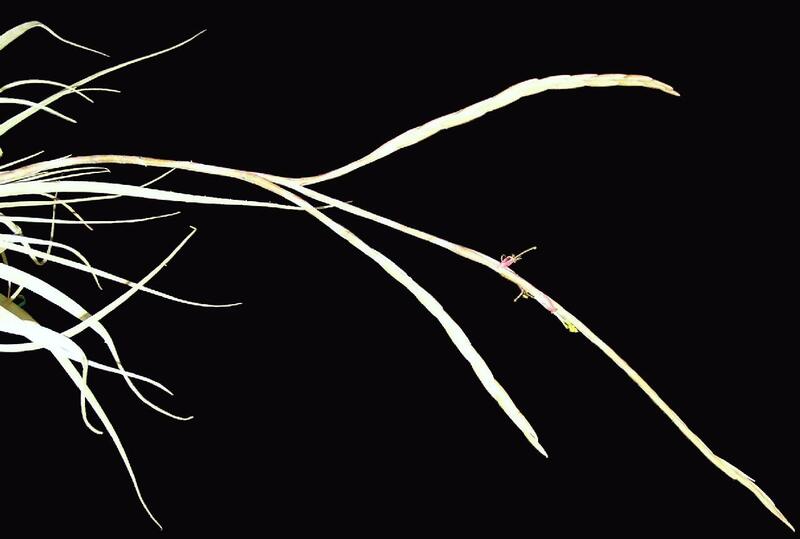 My plant was labelled V. cereicola so I guess I have no reason to change it." (See T. cereicola, this web site). Andrew Flower..."Bruce, you are probably right. My plant is labelled "TV Pending" for now! So when I get another flower on mine, I'll be dissecting it and measuring/photographing the parts for submission to the experts - meanwhile I guess I leave it in the pending basket." Peter Tristram..."As far as I can figure TV hitchcockiana was described before TV cereicola and they are variations on a theme! I have accumulated many clones of this group, either as hitchcockiana, cereicola, or NOIDs. 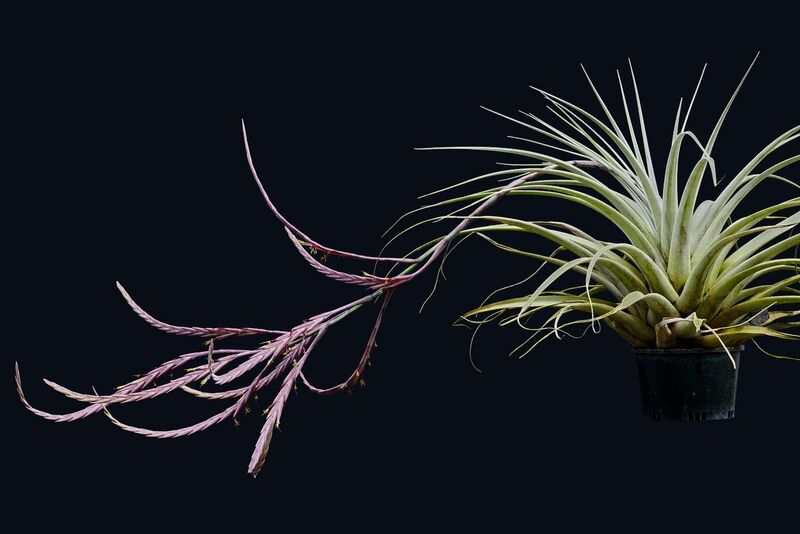 I even collected one, and they are all basically impossible to differentiate florally, within a range of sizes, degrees of branching and pendulousness. 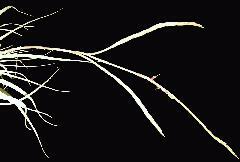 One group pups with interesting stolons though, like giant espinosaes." Derek Butcher..."When Mez described cereicola in 1906 (See attachments which show differences to what Smith showed us in S&D) and Smith described hitchcockiana in 1930 there were clear differences between the two species. 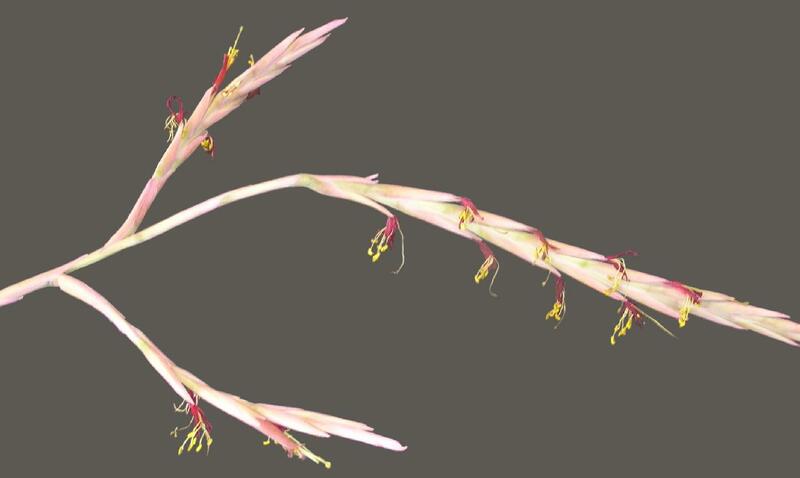 Both Mez and Smith agreed that if sepals widely exceed the floral bracts you have hitchcockiana and if less than you have cereicola. 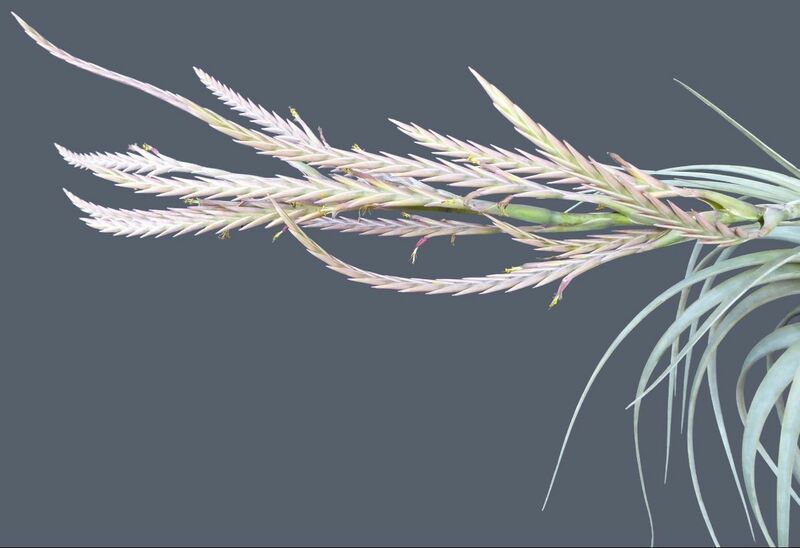 Mez also said that sepals were unequally joined for cereicola but Smith does not mention this. 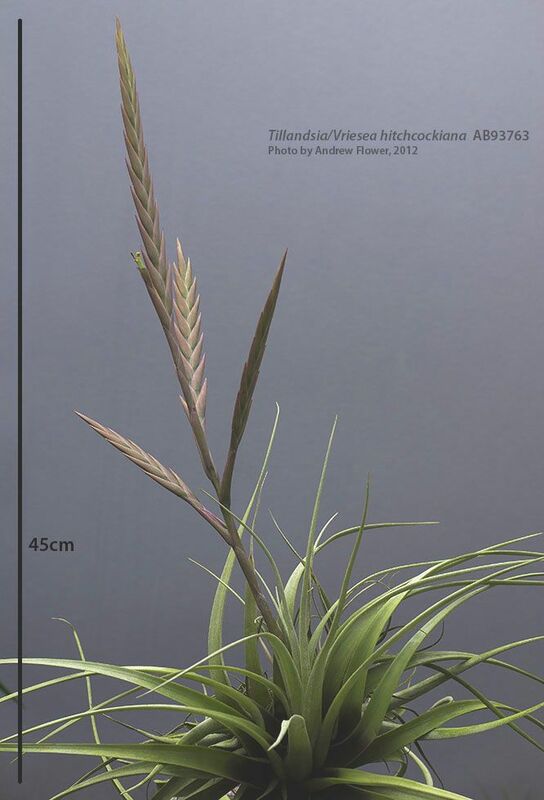 These descriptions would have been correct when the plants were found but it seems plants found since, including these latest photos, show that when you compare sepal/floral bracts relative sizes you scratch your head. Nobody has yet checked if sepals are joined." Peter Tristram 11/13. The really large form I got from Kent’s about 1980. It doesn’t pup on stolons. Bruce Dunstan ... "Something to get the taxonomists excited. I struggle to tell hitchcockiana and cericola apart. 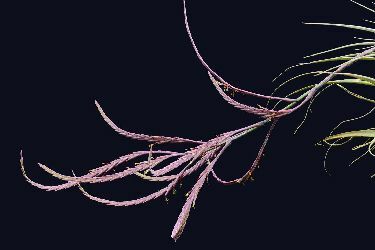 The floral bracts do appear to be shorter than the sepals on this plant, although it looks so close to Andrew's cericola images on the disc." 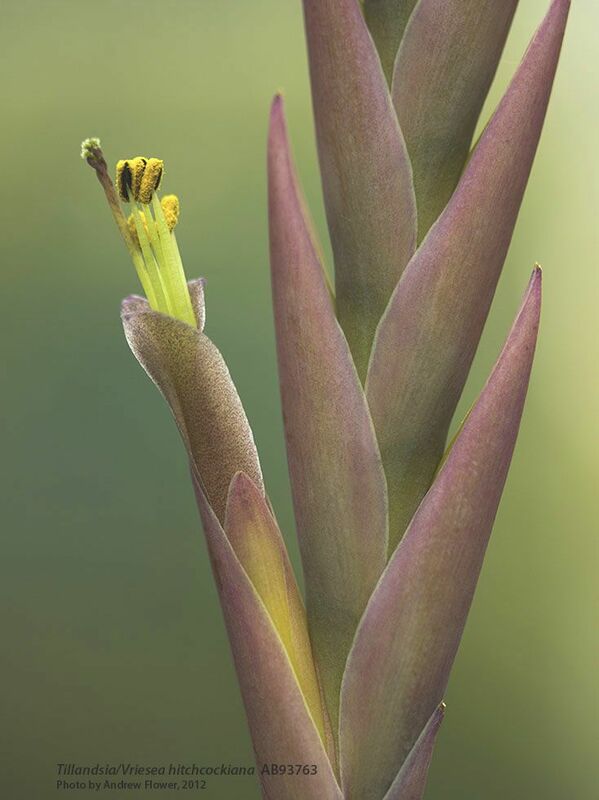 Peter Tristram ... "Nice hitchcockiana imho – floral bracts flare out as distinguished from cereicola. Check the DVD incuding my pics of a plant from Lotte which is from a paratype from memory or at least from the type locality. cereicola pups on stolons too. I wonder which hitchcockiana clone as it’s got lots of branches. Quite a few coming into bloom here from many sources – Europe, Knize, BRT and from the old days – Kent, Krauspe, Tropiflora. 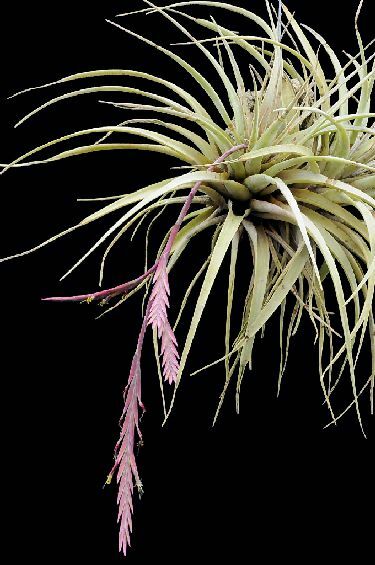 Vriesea hitchcockiana (L. B. Smith) L. B. Smith, Contr. U. S. Natl. Herb. 29: 446. 1951. 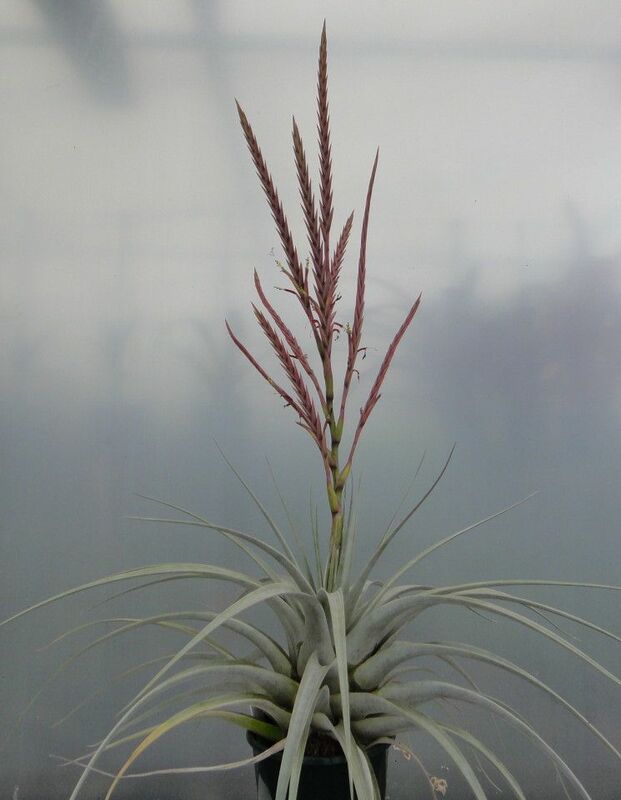 Plant flowering nearly 1 m high. Blades very narrowly triangular, 35 mm wide. 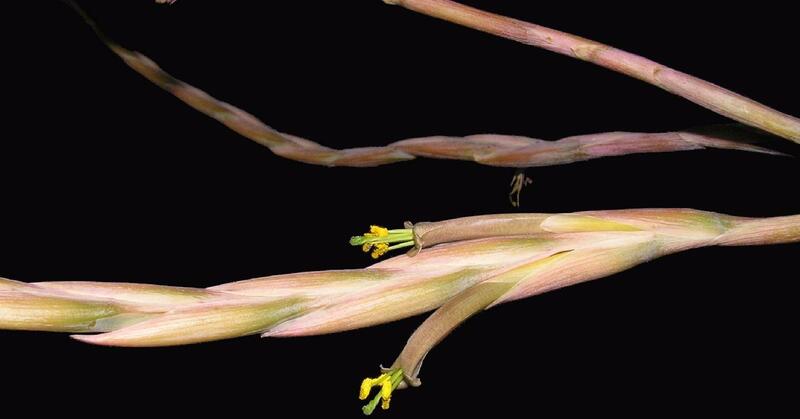 Scape-bracts imbricate and clasping, elliptic, lepidote, the lower long-laminate. Rhachis slightly undulate, narrowly alate and forming pouches about the flowers, sulcate; internodes 1 cm long. Flowers suberect, 4 cm long. Capsules cylindric, 25 mm long. Type. Hitchcock 21323 (holotype GH, isotype US), El Tambo to La Toma, Loja, Ecuador, 3 Sept 1923. DISTRIBUTION. 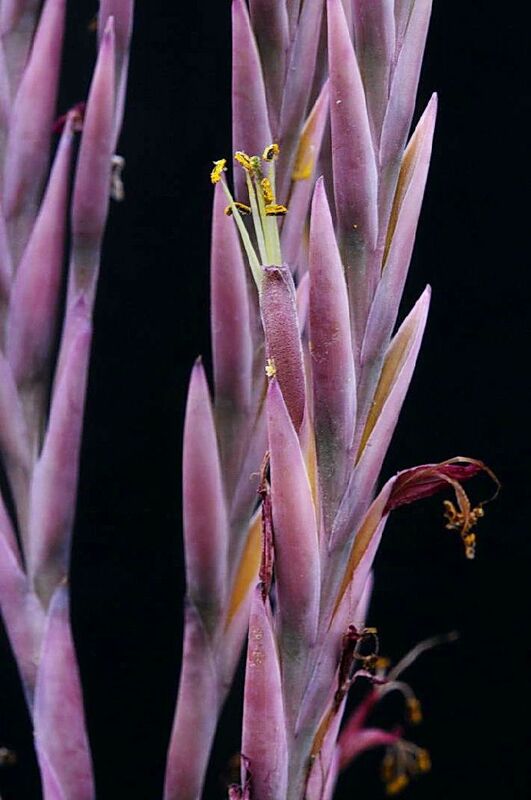 On trees and cacti, open forest, 1200--1900 m alt, southwestern Ecuador and northwestern Peru. ECUADOR. Loja: Vilcabamba to Cachiyacu, 6 Oct 1943, Steyermark 54370 (F, GH); Puente Boqueron to Gonzanama, 9 Oct 1955, Asplund 18111 (S); km 25, Loja to Catamayo, 10 Aug 1965, Gilmartin 1121 (US); same, km 27, 1124 (US). PERU. Piura: Cambaque, 28 Aug 1956, Rauh P-310 (HElD, US); Abra Porculla, Olmos to Dagua, Rauh 20369 (HEID, US). CAPSULE ca. 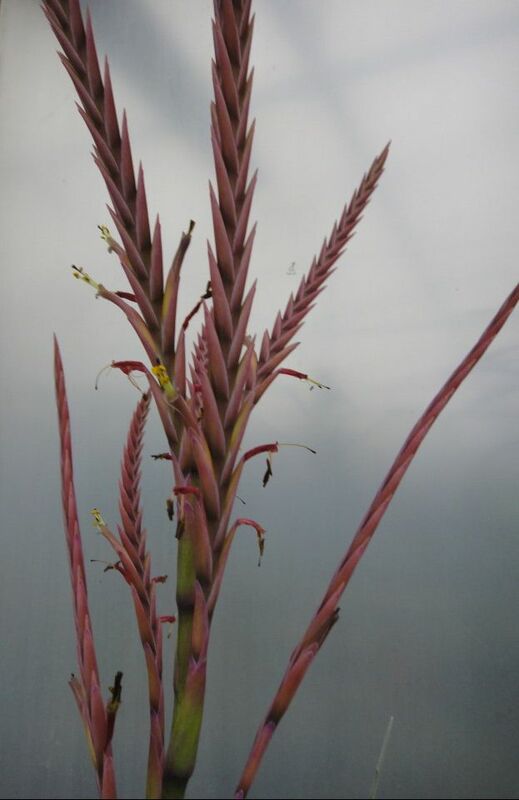 3.0 cm long or more, distance between flowers ca. 1.0 cm throughout. MATERIAL EXAMINED: Hitchcock 21323 (US, TYPE) epiphytic, between El Tambo and La Toma, Prov. Loja, 1000-2200 m, 3 Sept. 1923; AJG 1121 (US) epiphytic, very common, dry deciduous scrub, open forest, no water in tank, seeds very abundant, some on tree trunks minus the seed with coma only, the seeds seeming to have been insect eaten, km 25 Loja-Catamayo, Prov. 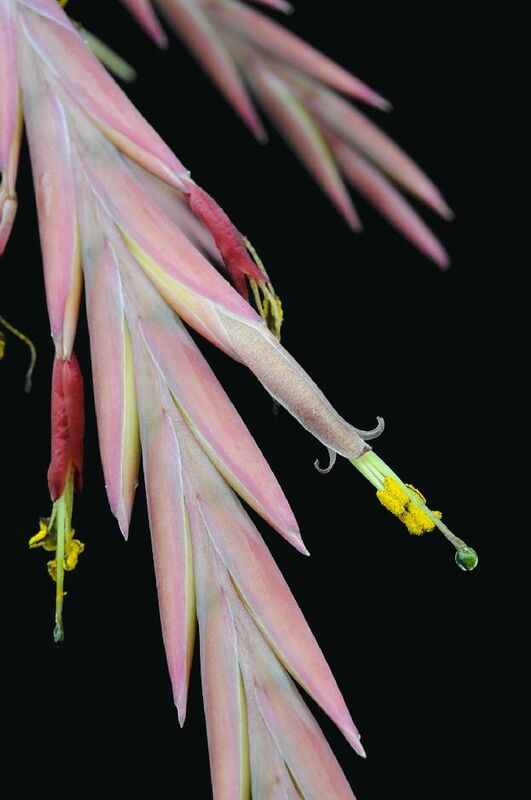 Loja, 1900 m 10 Aug. 1965; AJG 1124 (US) epiphytic, same type of community as AJG 1121, km 27 Loja Catamaya, Prov. Loja, 1800 m, 10 Aug. 1965. Fere metralis: foliis haud bulbose rosulatis, 4 dm. longis, utrinque dense ferruginascenti-incanis lepidotis; basi in vaginam maximam, ovalem, ferrugineam dilatatis; super vaginas ad 35 mm. 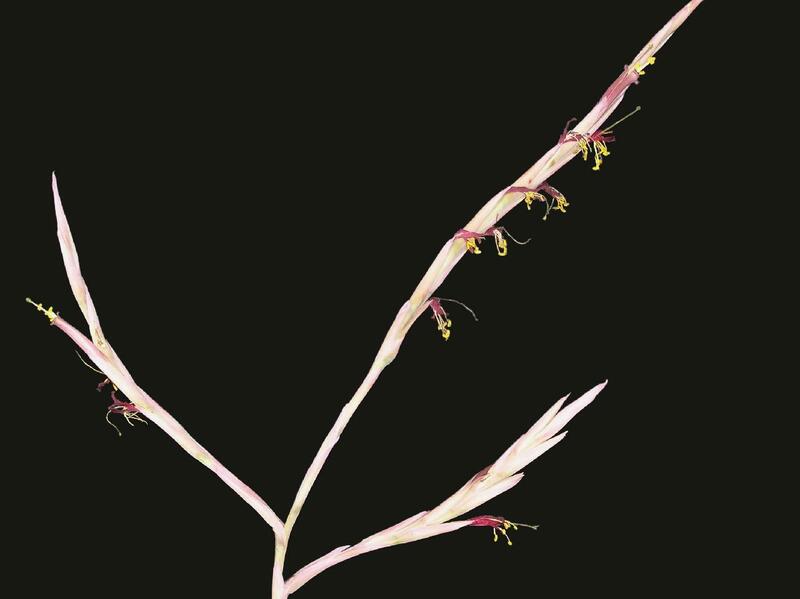 latis inde in apicem acutum sensim angustatis: scapo glabro, sulcato, arcuatim decurvo, valido, vaginis ellipticis, lepidotis, internodia optime superantibus, infimis longe laminatis dense involuto: infloreseentia pendula, subdigitata e spicis 6-7: bracteis primariis ellipticis, late acutis, haud ultra 4 cm. 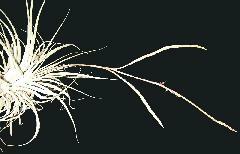 longis: spicis subaequalibus, anguste oblongis, 25-35 cm. longis, ob bracteas patulas 2 cm. latis; spicarum rhachibus glabris sulcatisque, leviter undulatis, angulatis, angulis ad flores in alas angustas productis; bracteis florigeris imbricatis sed axin paulo obtegentibus, submembranaceis, glabris sulcatisque, ad 28 mm. longis, quam sepala distincte brevioribus, fere omnibus ad apicem versus valde recurvo-patulis: floribus fere ercctis, 4 cm. longis, 1 cm. distantibus, breve (3 mm.) stipitatis; sepalis liberis, haud carinatis, 21 mm. longis; petalis purpureis (ex Hitchcock), quam stamina brevioribus, basi callis binis verticalibus praeditis; antheris anguste linearibus, quam filamenta vix latioribus, 8 mm. longis; filamentis undulatis; stylo perlongo; ovario 8 mm. longo: fructo ignoto. Pl, IV, figs. 2-5. ECUADOR: Loja: between El Tambo and La Toma, alt. 1000-2200 m., 1923, A. S. Hitchcock 21323 (G, type; US, cotype). 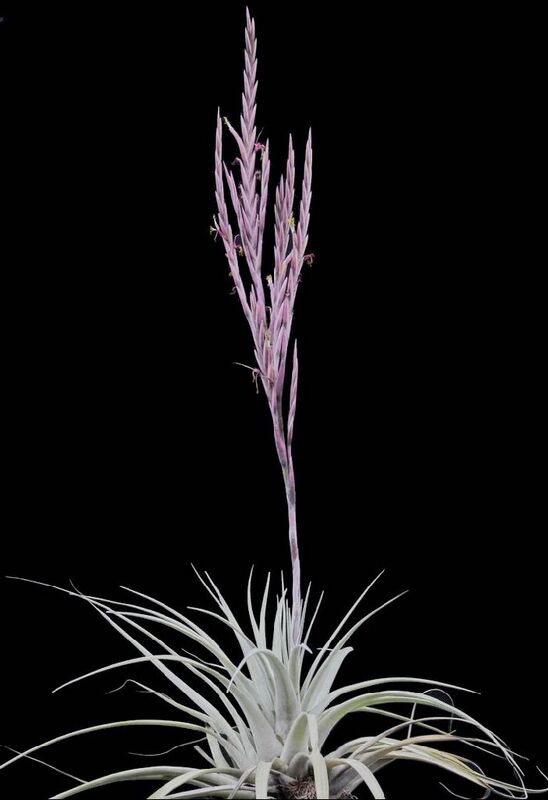 This beautiful and striking species is related to T. incurva, T. cereicola and T. patula and the close resemblance of its inflorescence to that of T. subimbricata would argue that the latter species, though its flowers are as yet unknown, probably belongs to the section Platystachys also. 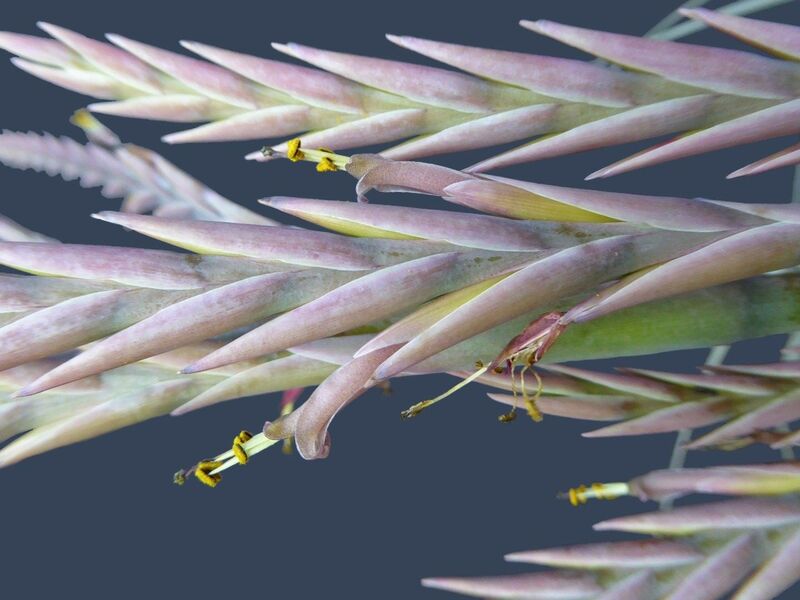 T. Hitchcockiana is easily distinguishable from its near relatives by the combination of densely furfuraceous-lepidote leaves and of floral bracts shorter than the sepals. 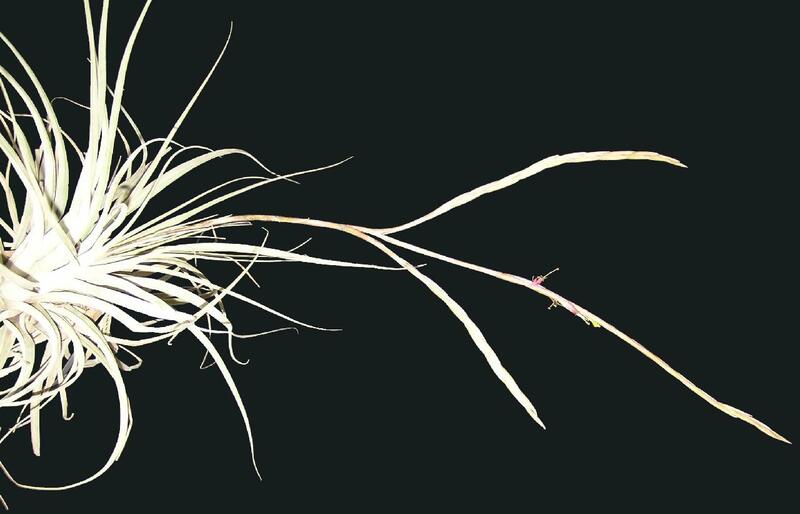 The recurved-spreading character of the floral bracts is of very doubtful importance as a specimen (Fendler 1524) of T. incana in the Gray Herbarium shows both incurved and recurved floral bracts on the same spike, yet its strongly spreading-tipped bracts are the most-striking single feature of T. Hitchcockiana. 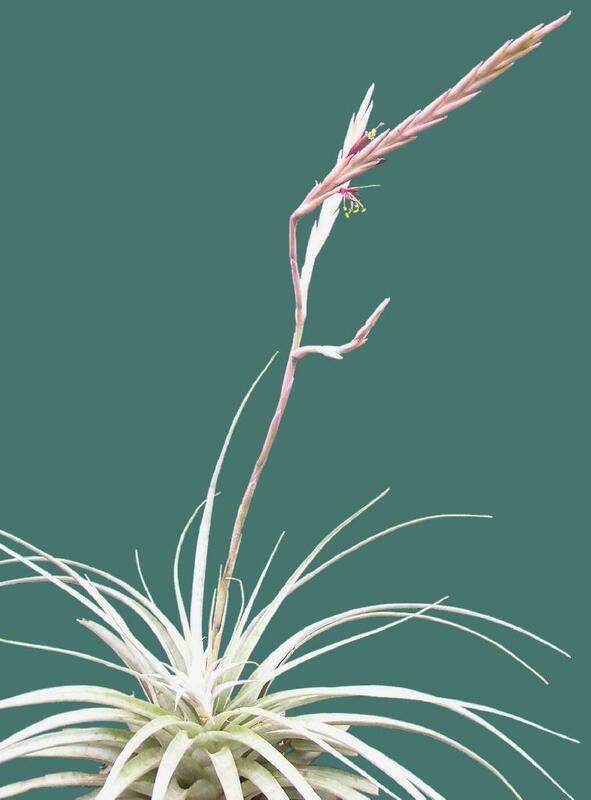 The species is unusual in having two lateral folds on each petal, a rare occurrence in Tillandsia.